Decorating for spring doesn't have to be hard. 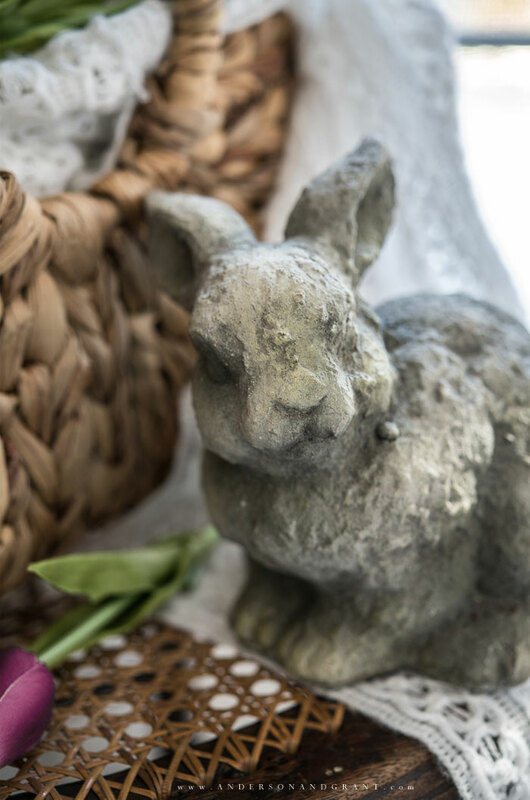 Creating a few small vignettes help to make your home look seasonally appropriate without feeling overwhelmed by having to decorate the entire house. 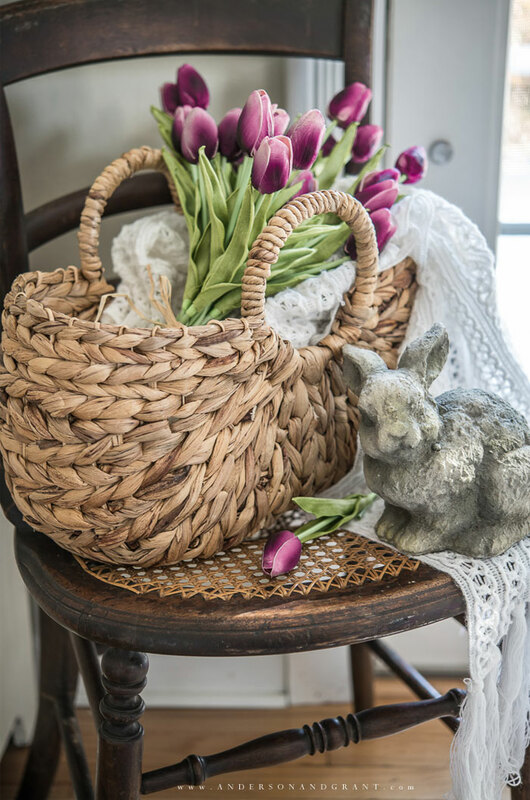 Read on to learn how to make a simple spring vignette in your own house. There is so much potential in a small vignette. They are often overlooked when viewing the big picture of a decorated room. But I love thinking about the small display existing on a coffee table or that moment created with just a vase of flowers and special trinket on your bedside table. To me, a vignette is simple. It isn't about creating an elaborate display but rather adding a special touch to a small space. You don't need to own a lot of decor to create a small vignette and they won't take you a lot of time to put together. Last week I shared a simple vignette created around a free spring printable I created so it is possible to decorate without spending anything at all! A vignette is kind of like a little decorating moment.....it's a chance to add just enough to show up for the holiday or season without feeling like you have to cover the house in decorative objects. Eventually, though, you can add up those small vignettes and realize you've decorated a whole space. 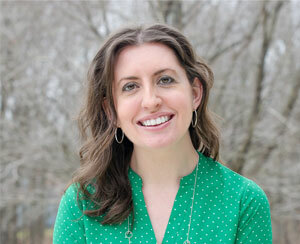 My friend Kendra from Joy in Our Home asked me to join in with her and some other bloggers this week to spread a little spring inspiration with our readers. There are seasonal recipes, DIY projects, mantel displays, front porches, and today is (obviously) all about vignettes. Links to everyone participating this week appear near the end of this post. 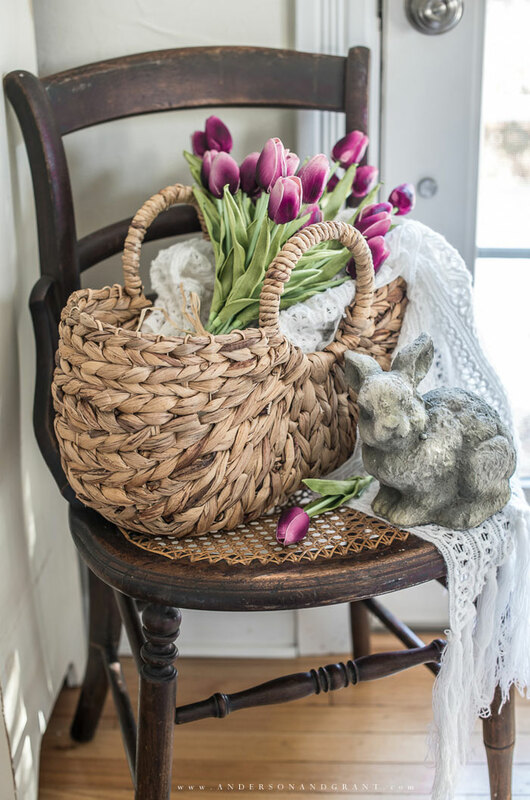 Just because this is a spring vignette doesn't mean that everything has to scream spring. Actually, you notice those seasonal touches more against a backdrop of your ordinary decor. 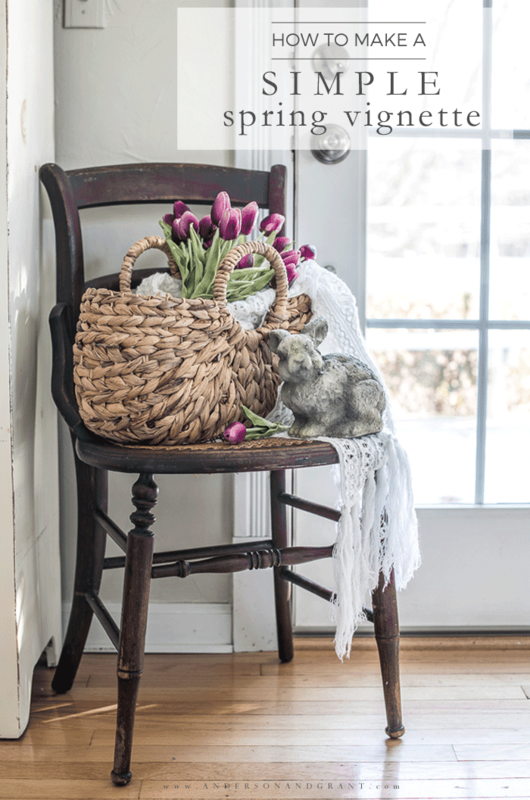 To add a little softness to the vignette, I draped a woven throw falling out of the basket and down onto the chair. Not only does this add a different texture, but it creates movement flowing through the vignette. Your eye doesn't stop on each individual piece, but rather sees the display as a whole. 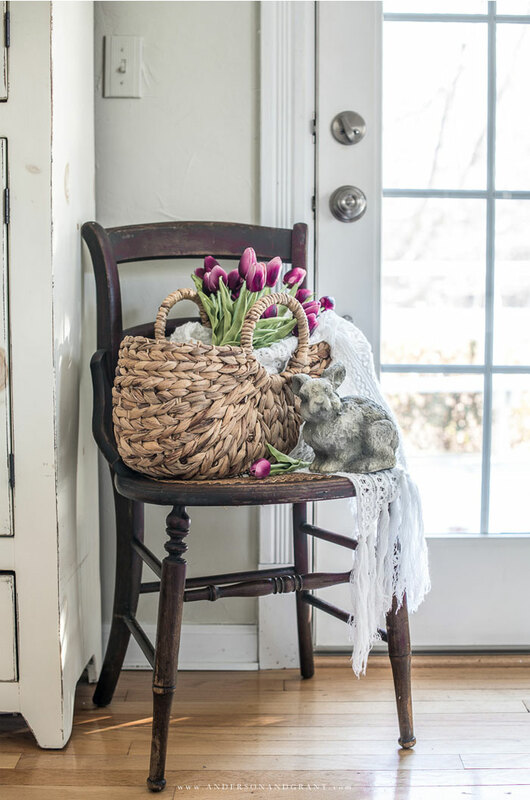 To finish off the simple spring vignette, I placed a small cement bunny next to the basket and on top of the throw. 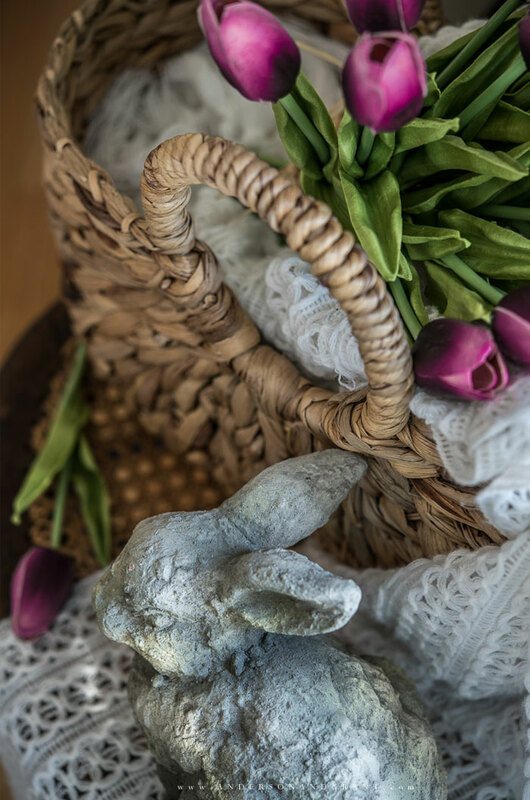 I picked him up a few weeks ago at a little local shop and really love that he can be used throughout the spring and isn't just an "Easter" bunny. 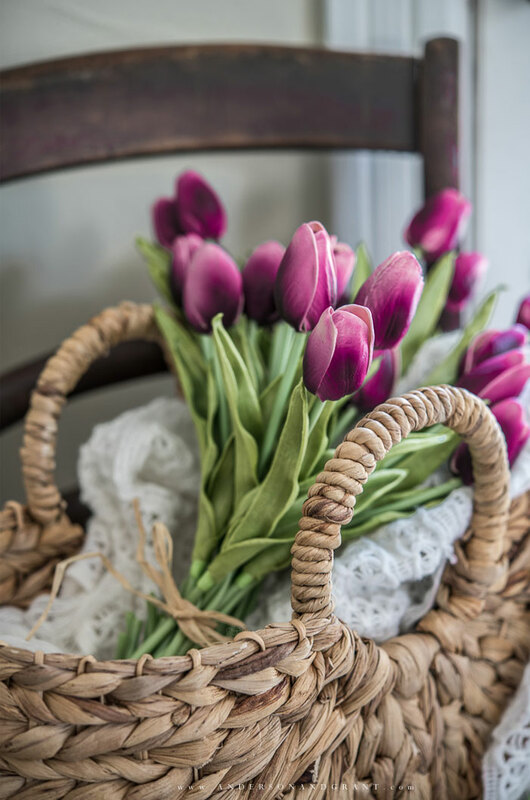 Plus, being a neutral gray really allows the color of the tulips to pop. 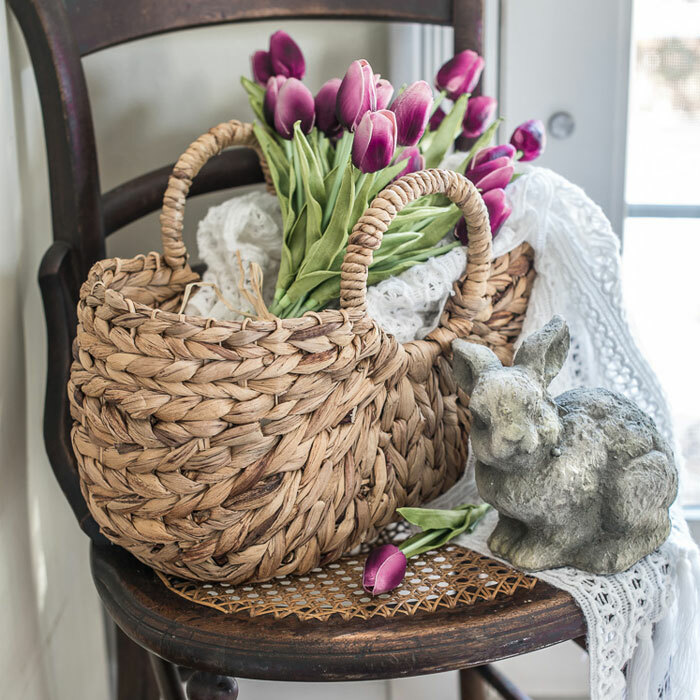 Adding the final little detail to the vignette, I placed a single tulip out of the basket resting on the chair. When decorating, we sometimes think we have to have everything perfectly placed and in order for the display to look good. But I like to do something unexpected, a little carefree. The same can be said for the casually draped throw coming out of the basket. Honestly, don't try so hard when it comes to decorating. Let things fall where they want. Make it a little messy. Decorating your home should be fun and enjoyable, so don't stress over having each thing in place. 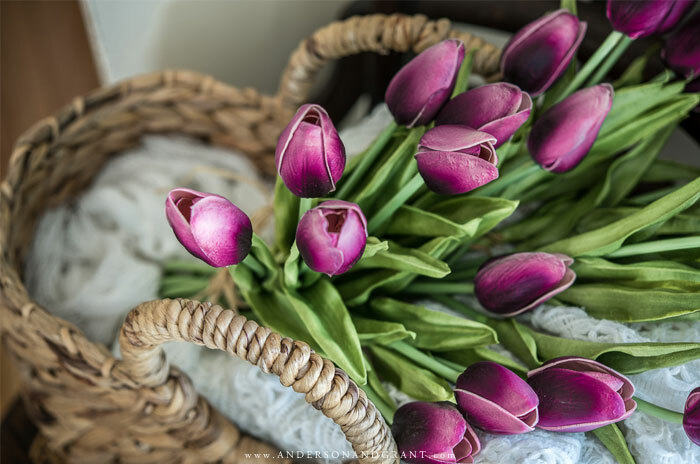 Well, I hope you enjoyed having a look at my spring vignette and that it inspired you to create a simple display in your own home. Next week I'll be sharing my mantel decorated for the season, so be sure to subscribe in the box at the end of the post or at the top of my sidebar to get a reminder to check back on Monday. Now, please take some time this week to browse through all of these spring posts on decorating, DIY, and baking!